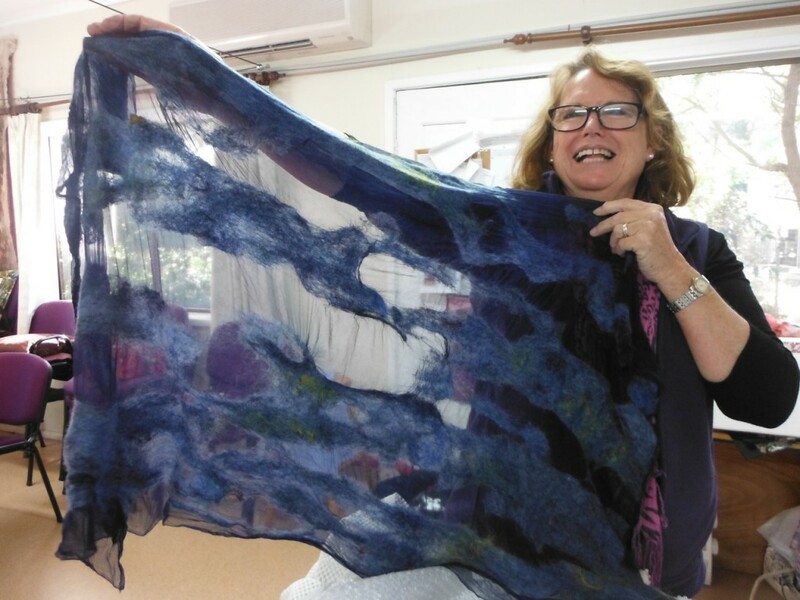 Here is Lynda on Wednesday night with her beautifully dyed tissue silk, ready to do her felting on the Thursday. The colours are fabulous and so much fun to be had. We can’t wait to see the finished masterpieces. By Lyn A. On Monday 29th June 2015, 17 of us headed out with our very game man Bruce at the wheel (without earplugs), to visit a few places. Firstly, we left the Cottage at 7.45am and headed north. Our first stop was at Maccas at Green Hills for a coffee and whatever we fancied. Back onto the bus and off to Feltfine. Gary and Kris run this wonderful business at Dunns Creek on his property of alpacas. We saw a few alpacas (and very beautiful at that) on our way in and out. Thanks Jenni for being our very beautiful “gate girl”. Reaching the shed at the top of the track, we all piled in and were amazed. What a wonderful sight. Fibre, fibre and more fibre. Beautiful fleeces, wool, batts for felting, silks, torn silks for knitting and weaving, skeins ready to knit and crochet. Gary gave us a talk on washing, carding, mixing and batting, and he and Kris started up the huge drum carder and made up a couple of scrappy batts for us to see. Around the drums it all went, as Kris threw in lots of beautiful fibres as it wound around the drums. It was then cut off and taken to the Needle Felting machine. A few more fibres added and it went through the process. 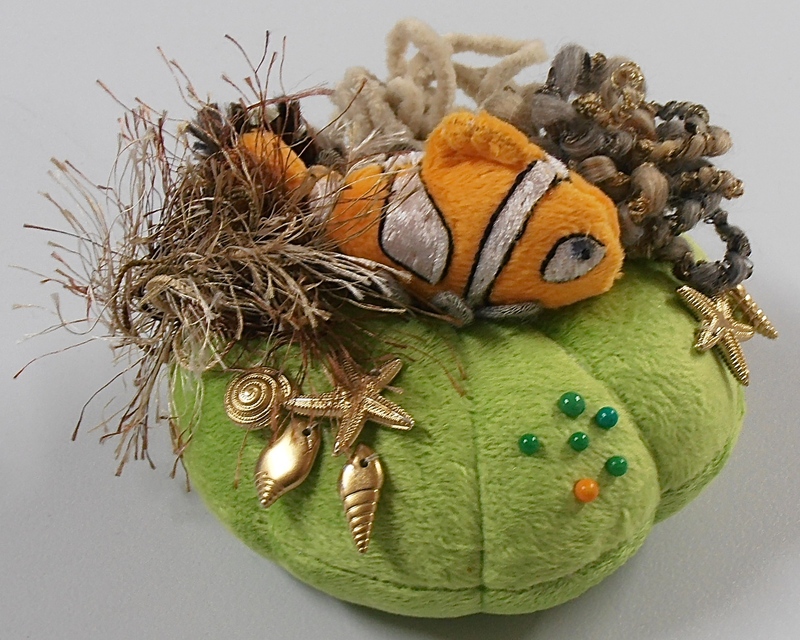 At the end was a fabulous Scrappy Batt, needle felted for easy felting. This takes the work out of things. We were all amazed at the process and the expert way Gary and Kris showed and helped us with everything. Such knowledge, all packed into one shed. We were all so busy and all looking to grab our bits and pieces for our individual items to be just that bit different from each other. All our minds were boggling. (No wonder a lot of us have curly hair, as too much is going on inside the brain). Bruce made sure we all saw the second shed. That had fabulous bits and pieces. Silk cocoons, the sari yarn, all types of spun fibre ready to put your mind to do whatever took your fancy. After a couple of hours there, all aboard and off to beautiful Morpeth. We had a walk and looked at a few of the shops open, then headed off to East Maitland. The drive was lovely. We all had a fabulous lunch (the $10 specials) at the Windsor Castle and then over the road to Glendoon Cottage Patchwork Shop. This shop used to be in Morpeth and moved into East Maitland. Carmel, who owns the shop, knew we were coming and had specials out on the table and as we purchased, she gave us a lovely pack she had made up of fat quarters etc. to each of us. This was extremely generous of Carmel and a very touching thought. Carmel’s hospitality was wonderful and a recommendation from all of us to visit her shop in the future. The pub’s car park was a perfect position for the bus to park. There we met up with a couple of ladies from the local area (pre arranged) and sold off our table looms and a spinning wheel. (Now we can get a nice new table loom.) The deal was done (you have heard of people selling things in pub car parks, but that could have been a new one with Spinners and Weavers equipment, not being the usual in a pub car park). All of us having a tummy full, chatted out, all our purchases in hand, had an enjoyable trip home. Thanks to Bruce for driving us and his entertainment. Everyone is now planning the next trip. That should be around November. How could you not have a great time with all the terrific company and personalities on board. Thanks to everyone who come along. By Lyn A. 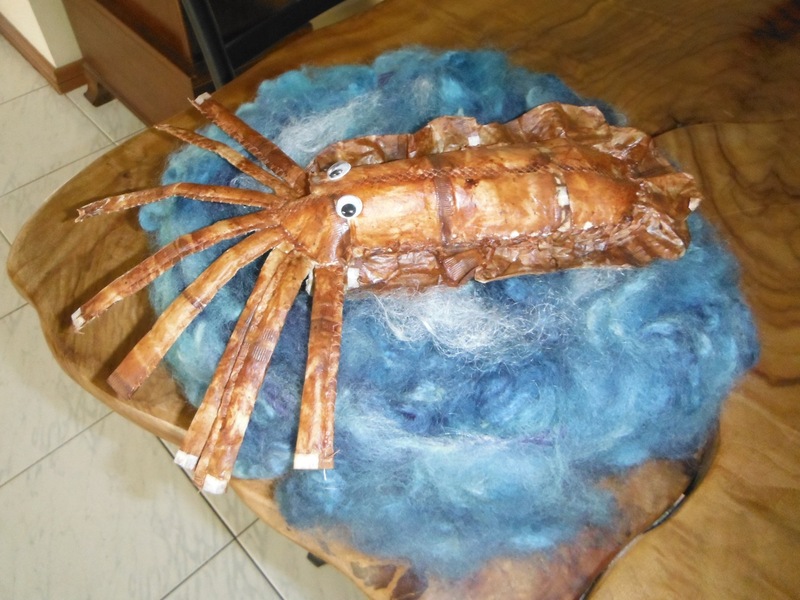 Here is a cuttlefish sitting on a bed of wool dyed for the ocean. The cuttlefish is made by Lyn out of used teabags, and sewn together. Very imaginative! 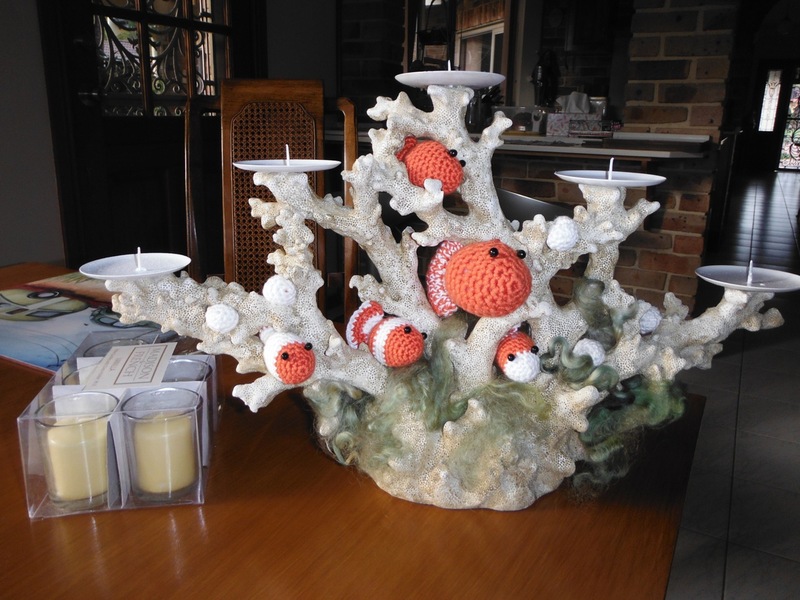 Debbie had this lovely coral candle stand tucked away, and knitted some clown fish before she moved back to New Zealand. Lyn put it all together and so we have another fabulous table decoration for our Gathering next year. 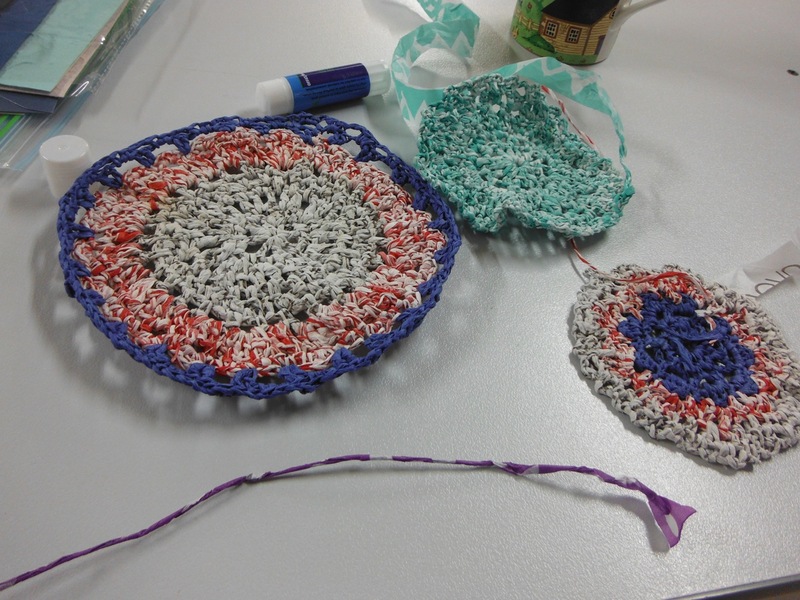 Katalin also showed us how to prepare and crochet tissue paper at our paper making workshop. 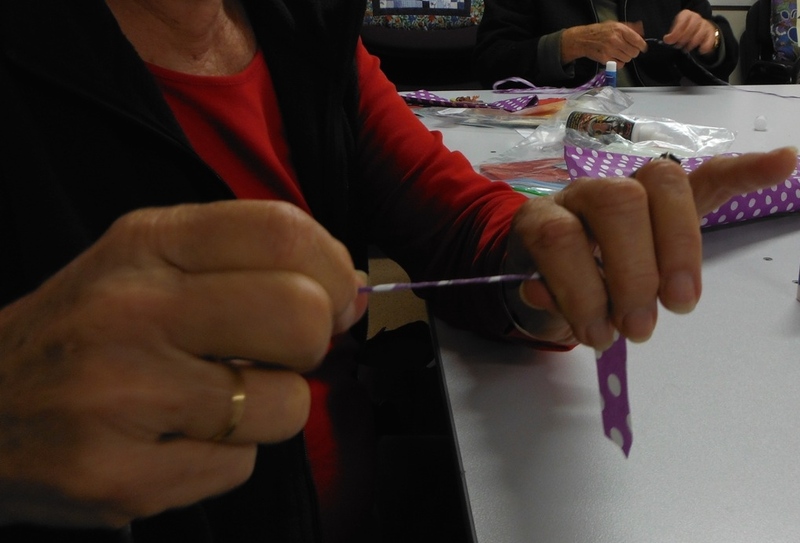 The pictures show how we cut and rolled the tissue paper and then the crochet circles. Amazing and looks fabulous. Holds together really well. Thank you Katalin. By Lyn A. We seem to be ploughing along with the felting on Thursdays. 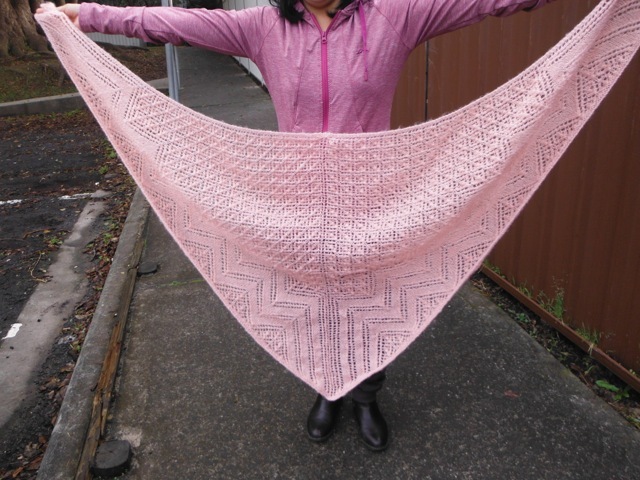 Here is Lynda with her beautiful shawl. 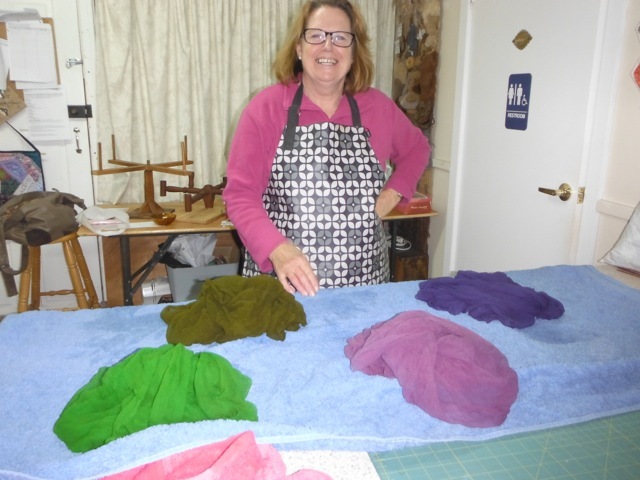 This piece is nuno felted and she is in love with the process. By Lyn A. On Tuesday 21st July we had a great day and four fabulous birthdays. Naomi was the big fifty and Sandra, Karen and Gay all within the next three weeks. 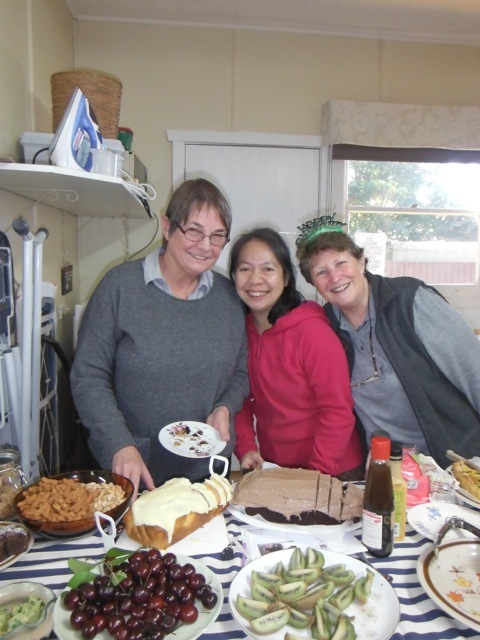 Everyone contributed to the food and pressies and it was great. Happy Birthday Girls. By Lyn A.
Linda made this beautiful Nemo table decoration for the gathering. 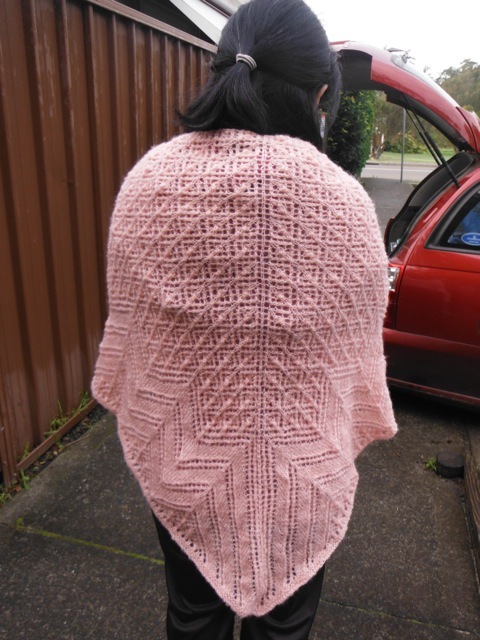 Great detailed work, Linda! A wonderful day was had by all at The Cottage on Thursday 25th June. We had a workshop on Paper Making and Card making. A very big thank you to Katalin, a member or ours, for her time and effort she put in to making the workshop a great success. We all went away with our brains full of knowledge and our kit Katalin had put together for us. Firstly we learnt how to make the paper and we were all able to make a couple of pieces for ourselves. We then went on with the art of decorating the hand made paper Katalin had supplied us with. A great day and try not to miss it all next time. By Lyn A.